Learn to upholster a dining or bedroom chair, using age old upholstery techniques: webbing, stuffing, stitching the seat pad into shape, tensioning of fabrics and develop an eye for the finishing details. The weekend is scheduled for you to be able to complete a chair with a traditionally upholstered chair seat. You will need to work at a steady pace to complete it. A chair with a back and/or arms will be very likely to take longer than 1 weekend! You are, of course, very welcome to come back to complete your work with me if necessary. We use tacks for traditional upholstery. If you want to use a staple gun then please bring your own. I cannot accommodate a big item like a sofa or winged armchair. Please don’t bring anything that needs machine sewing unless you are competent at using a sewing machine! Tartan or velvet is very tricky for larger items like an armchair, please bring something else for your first attempt. For items with one pad (dining chair) those fabrics are fine. If in doubt please get in contact! You will need to strip your chair down before the course to save valuable time. My workshops are good fun and hard work! You will be on your feet for most of the day – so comfy clothes and shoes are a must! 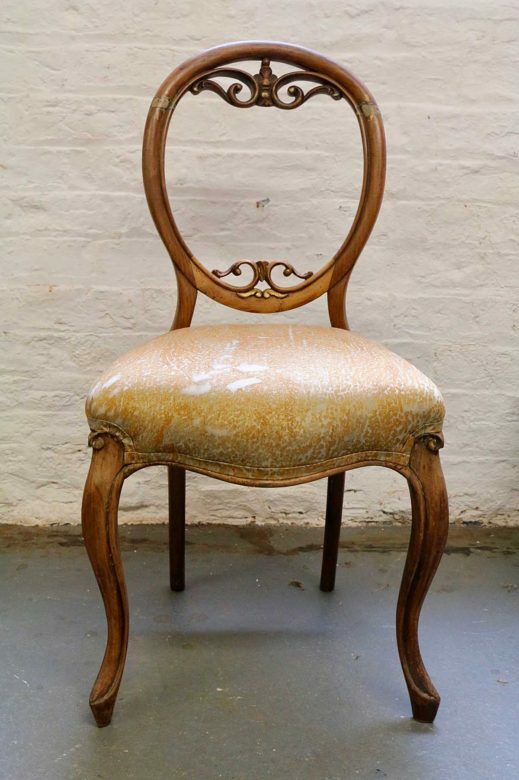 All courses are £145 which includes all materials for one traditional dining chair, apart from your top cover and trimmings. Rogues Atelier Studios is in Fossgate – a thriving city street full of great independent restaurants and cafes in the heart of York with easy access, ignore the ‘one way’ and ‘no entry apart from access’ road signs as you need to access the venue! There is central city car parking very close by, the cheapest is Peel Street. Your furniture can be dropped off with me before you park. Call me if you have any problems: 07960329286. I am a City and Guilds Traditional and Modern Upholsterer and trained at Jacob Kramer College in Leeds. I also studied Fine Art in Bradford University and achieved a BA Honors degree specialising in painting, printmaking and photography. I now combines those abilities to produce my own unique pieces of furniture. I have been upholstering on and off for 20 years and have run Upholstery and Soft Furnishings workshops for City of York Council. I’m known for my straight forward approach and believe that my students need to understand each stage thoroughly. I’ll make sure you get it right!